‘It’s absolutely surreal winning the World’s Biggest Coding Contest. With thousands of experienced coders participating I didn’t expect to win this mega competition. I guess I am lucky, but I also feel at the end of the day it is my hard work that has finally paid off. The future of coding is very bright, and coding is definitely the skill to reckon with in the future,’ said Sameer Gulati, Code Gladiator 2017 Champion. 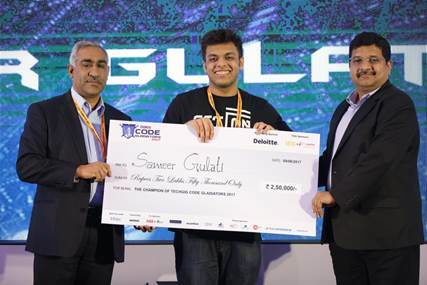 June 23, 2017: Twenty year old Sameer’s victory, at the World Record Breaking Code Gladiators 2017, provided ample proof that a Tech Revolution is taking place where youth has overtaken experience, as reiterated in TechGig’s earlier findings, that while working professionals constituted 72% of the total participants, almost 70% of the top scorers in the qualifying round had less than 2 years of experience. “We are privileged to be witnessing the dawn of a new era of technology, far from seeing a downturn, we are in the midst of a new awakening in the Indian IT Industry. The old guard is giving way to a new wave of young, bright and passionate technologists, and Sameer stands as a shining example of how far Indians are going to lead this new world order. I congratulate Sameer and all the other programmers who set a new world record at this event,” said Ramathreya Krishnamurthi, Business Head of TechGig and TimesJobs. The Winner – Sameer Gulati, a student of Jaypee Institute of Information Technology won Rs. 2.5 Lakhs Cash, Trophy and Certificate Plaque. The 1st runners-up – Rishi Vikram, a student of The LNM Institute of Information Technology, Jaipur won Rs. 2 Lakhs Cash, Trophy and Certificate Plaque. The 2nd runners-up – Dilip Kasana from Mobileum India won Rs. 1.5 Lakh Cash, Trophy and Certificate Plaque. Dilip also won the ‘Beat the Leader’ challenge and was awarded a further Rs. 1.5 Lakh Cash, Trophy and Certificate Plaque. The TechGig Code Diva Award at Code Gladiators 2017 went to Deepika Rodda from Scientific Games India who won Rs. 50,000 Cash, Trophy and Certificate Plaque as the best female coder. TechGig Code Gladiators 2017 set the world record for the largest computer programming competition as declared by Guinness World Records. With over 2 lakh participants who registered for Code Gladiators 2017, TechGig has once again consolidated its position as the presenter of India’s Biggest Coding Arena. ‘TechGig Code Gladiators’ – the undisputed leader in coding contests, had already won the Limca Book National Record for the same in 2015 and 2016, and now holds the 2017 Guinness World Records for the largest computer programming competition in the world. If you would like any additional details or an exclusive interview with Sameer, or the other winners do let us know, and we would love to arrange it for you!